William Parschalk graduated from the Johns Hopkins University in 2007 with a B.A. in Writing Seminars and a certificate in Digital Media. He served his undergraduate newspaper as Editor-in-Chief. After graduation, he taught English for 16 months in Nagoya, Japan. Parschalk began working for the AFRO-American Newspapers in 2009 as a member of the web staff. In March 2010, the AFRO launched a new website for their readers that he has managed and expanded. He has a long-running interest in media’s role in the community and the process behind creating D.I.Y. publications, both in print and online. 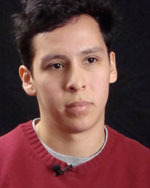 William Parschalk learned in his teenage years how news that “is relevant to people” could move through a community after it has been published.